Chocolate and Teal would be great wedding colors……. – Butter, Baking, and Bacon! 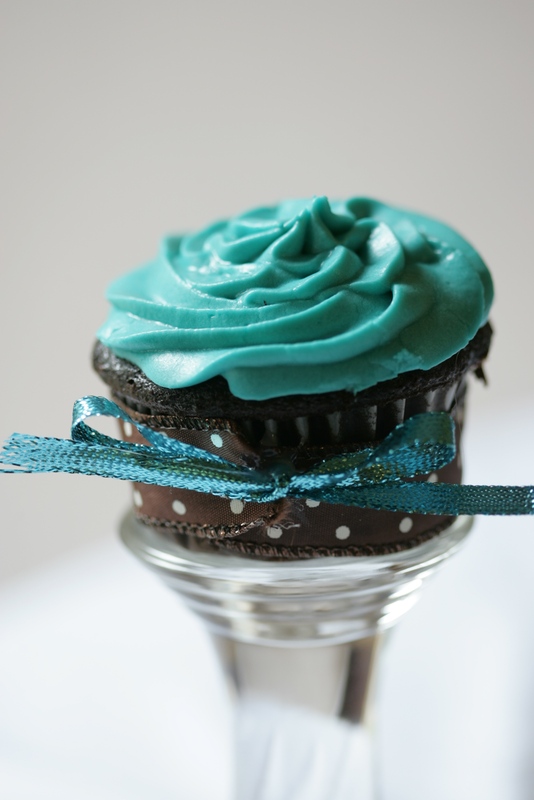 Chocolate and Teal would be great wedding colors……. …..well for now I guess they’ll just have to be great cupcake colors. These cupcakes were featured at the Covenant Hospice Chocolate Affair fundraiser here in Tallahassee, FL. We baked and decorated 250 of these delightful morsels! They are dark chocolate fudge cakes with Ghiradelli chocolate with a teal milk chocolate whipped buttercream. At the fundraiser, we topped them with fresh raspberry and a sprig of sweet mint. They were a huge hit! And we have the award hanging to prove it! who did not like this.chocolate taste is best. I love this idea, especially with the polka dot ribbon. Super cute. I might try this for one of my son’s birthdays. i love this cupcakes. and this is nice site for cakes. thanks! Really sweet to look…Site is Making people to order for cakes…. This is probably the most gorgeous cupcake I have ever seen! It would go perfectly with Tiffany teal wedding color theme. I LOVE IT!